Massage stone warmers, or hot stone heaters, are salon-style heaters that will warm up massage stones for manicures, facials, massages and pedicures. The claimed benefits of hot stone massage therapy include: boosted blood circulation and stimulation, decreases in pain as well as inflammation, improved metabolism and treatment of muscle spasms and stiffness (Source). Some models like the Royal Massage Clamshell hot stone heater uses heating plates and has capacitty for 10 small or 4 large stones, while the Sivan hot Stone Heater uses heated water and can hold 42 stones, with an operating heat range of 120 to 150°. The Royal unit has the ability to heat up to 122°, by contrast, in under 10 minutes all while maintaining a cool to the touch exterior, which is an attractive white clamshell shape. Users of the Royal stone heater report that it warms the stones up to an appropriate temperature- so that they are not too hot to touch yet are still hot enough that they are relaxing for massaging muscles. Let's take a look at 5 of the best-selling massage stone warmers on the market today and see how they compare! The Royal Massage Clamshell Hot Stone Heater w/4 Hot Rocks is a massage stone warmer. A massage stone warmer is a product that professionals often use for the variety of treatments that warm stones are used for at many spas. Many users were quite surprised at the quality they received from this massage stone warmer especially for the price tag that comes with it. They liked the idea that even though the Royal Massage Clamshell Hot Stone Heater warmed the stones quite well, the unit itself on the outside remained cool to the touch. 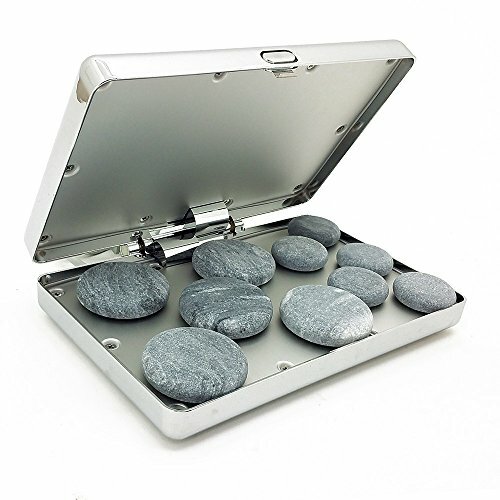 Users liked the idea that the massage stone warmer came with four of its own massage stones and were even happier to discover that the unit can actually hold up to 10 smaller stones for massage purposes or the original larger stones that it comes with. Users also were pleased to discover that the Royal Massage Clamshell Hot Stone Heater has the ability to heat up the stones to 122 degrees within just 10 minutes. They also like that the massage stone warmer is quite compact, lightweight and easy to use and take with you wherever you might need or want to use it. Not only is this massage stone warmer good for the non-professional, those professional users who have experienced the Royal Massage Clamshell also love using the item. Professional massage therapists like the idea that if the client wants to be visited in their home the unit can easily be taken with them to give their clients a good sample of what hot stone massage is all about. Not only does this massage stone warmer heat up quickly it also is extremely quick and easy to clean up. The Sivan Health and Fitness 6QHTR Professional 6 Quart Hot Stone Heater is a massage stone heater that can be ideal for professionals and their clients because it has quite a large capacity for holding up to 42 different stones. This means that it can heat sets of 20, 36, and 40 piece stone sets. However, this massage stone heater will also work well for the non-professional who is looking for a way to melt away all the aches and pains of the day. Many users have found that this massage stone heater combined with aromatherapy is ideal for manicures, pedicures as well as facials. 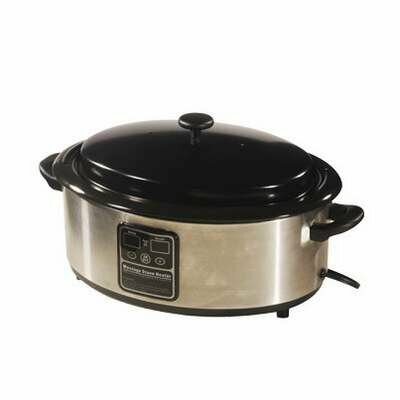 Users like the idea that the product has a removable water reservoir and that it has a temperature control feature with a pre-set setting of 375 degrees. 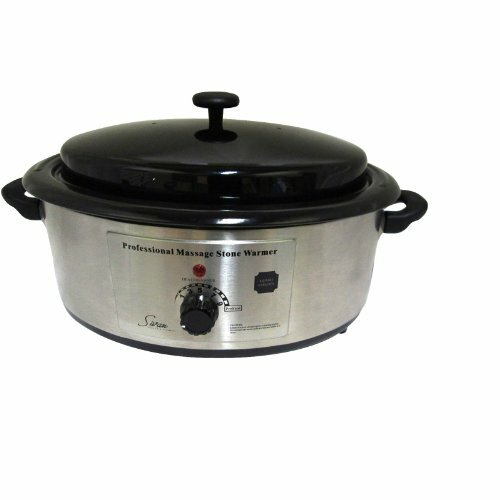 It also has an operating range of 120 to 150 degrees that helps to heat of the massage stones quickly and easily, creating the proper temperature for personal and therapeutic use. Another nice feature that many users like is that the massage stone heater maintains an even and constant temperature and has an indicator light that lets the user know when the ideal temperature has been reached, so there is no guesswork. 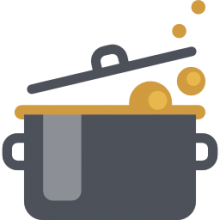 One concern for some users is that it tends to have a smell when first using that takes quite some time to get rid of. The 6 Quart Hot Stone Heater – Digital Stone Warmer is a massage stone warmer that many users will find to be extremely easy to use, especially for those who are fairly new to massage stones and the heating of the stones that are used for massage therapy. One of the main things about this particular massage stone heater is that most users will admit that it is very easy to use. All one needs to do is remove the bowl that is in the heater, fill it up with cold water, put back in the heater and then use the digital controls on the massage stone heater to adjust the water to whatever temperature that the user desires for their massage treatment. Many users like its sleek look and that it is composed of rust-free metal and aluminum. They also like the fact that the heater is completely digital and can warm up the massage stones to 160 degrees and will maintain this temperature all throughout the massage therapy session so there is no need for reheating the water and the hot stones. Users also noted they liked the compact size while still being able to hold a good amount of stones. Some users don’t like the idea that it is necessary to pre-heat this massage stone heater for 20 to 30 minutes before you can actually set it to maintain a constant temperature. 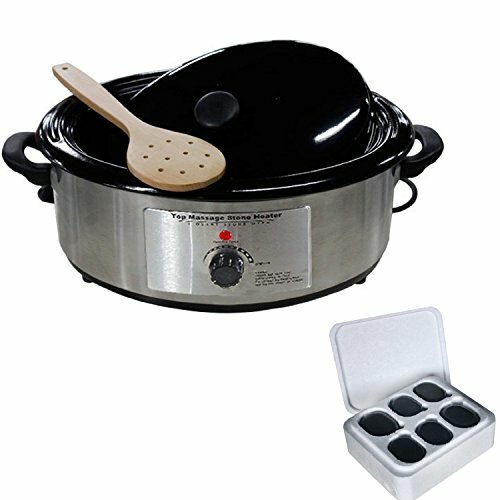 This 6 Quart Professional Quality Massage Stone Heater/Warmer – Hot Rock Cooker oven is not just a massage stone heater for professional users, it is also well suited for personal use as well because of how easy it is to use for anyone interested in massage stone therapy especially when it comes to facials, pedicures and manicures, users have found this massage stone heater ideal for such purposes. One particular feature that many users enjoy is the fact that this massage stone heater comes with a nice Teflon coated water reservoir that is removable for easy filling and easy cleaning. They also like the fact that this 6 Quart Professional Quality Massage Stone Heater can also maintain a constant temperature to continually keep the massage stones warm and that it has a nice indicator light that alerts the user to when the ideal temperature has been reached. It is also a nice size and can hold 20, 36 and even 45 stones depending upon what the users’ needs are. Another nice feature of this massage stone heater is that it is made with a stainless steel outer casing and has a durable steel pan for holding the stones as well as large handles on the unit to avoid any burns when handling it. 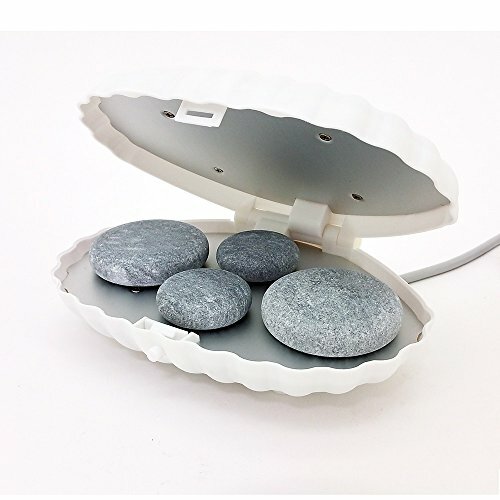 Users also like the fact that this massage stone heater comes with its own 16 piece massage stone set. If you are looking to purchase a hot stone heater, you either work in our own a spa or salon, but perhaps you're a freelance massage therapist that enjoys using hot stones as part of your massage the team. The way some users employee these machines, they will have four stones inside the heater and use one at a time, cycling them so that the person receiving a massage always has a hot stone, and there's always another hot stone ready to take its place inside of the heating machine. Some people just like to have hot stones in their home- after a long day at work, many people will relax with a hot stone wrapped in a towel, placing them on sore backs and knees to get a little bit of pain relief. Before you purchase a hot stone heater, make sure that you understand how many stones you intend to heat at a time. Smaller units may hold 4 large stones at a time, while larger alternatives can hold upwards of 40. Users, particularly licensed massage therapist, prioritize stone heaters that heat up quickly, work quietly and maintain a consistent temperature- so that while they are giving a massage they are not surprised by massage rocks that are too hot or too cold. Indeed, hot stone massage is growing in popularity-with many massage therapist reporting satisfied customers to enjoy nothing more than having hot massage rocks placed on their bodies. Massage therapists recommend that to perform a successful and safe hot stone massage that the stone should be sanitized and heater should be kept clean at all times. You also want to ensure that the thermometer is providing accurate readings- you would not want to find out too late that your hot stone massage heater was overheating and accidentally burn a client or yourself. Some massage therapist even recommend using cold stones, frequently granite or quarts, to provide a temperature contrast. And, finally, you will not want to let the hot stones sit in a persons body for too long period of time- certainly not enough that it will injure the skin. Some massage spas even install eye massagers as a separate business line- so consider that if you run a business. If you are looking to purchase a hot stone heater, read our reviews on this page and check out the comparison table to get a good sense of the different options that are available to you on the market today.